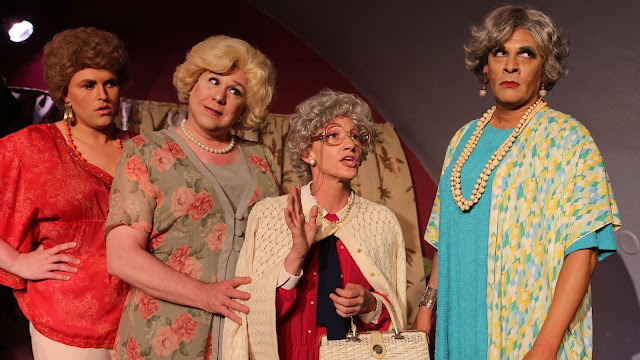 (left to right) AJ Wright, Ed Jones, Adrian Hadlock and David Cerda in Hell in a Handbag Productions’ 2017 production of THE GOLDEN GIRLS – THE LOST EPISODES, returning for Handbag’s 2018 season. Photo by Rick Aguilar Studios. Plus: a soon-to-be-announced Holiday Production! 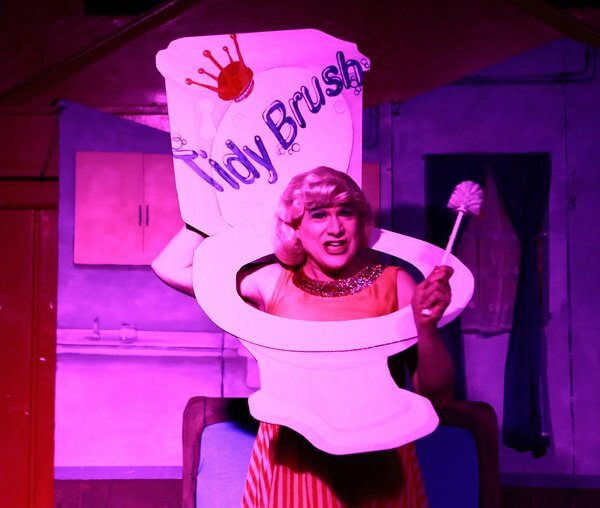 (pictured) Ed Jones in Hell in a Handbag Production’ 2013 production of L’IMITATION OF LIFE, returning for Handbag’s 2018 season. Photo by Rick Aguilar Studios. Hell in a Handbag Productions is pleased to announce its 2018 season, kicking off this spring with a revival of its 2013 hit L’IMITATION OF LIFE, a dead on parody of the 1959 film Imitation of Life about race, mothers and daughters – and looking fabulous! Adapted by Ricky Graham and Running with Scissors and directed by ensemble member Stevie Love, ensemble member Ed Jones and Robert Williams reprise their roles as Lana Turner and Annie Johnson. This summer, Dorothy, Rose, Blanche and Sophia return for THE GOLDEN GIRLS: The Lost Episodes, Vol. 2. Following last year’s sold-out, seven-month run, Handbag’s parody of the beloved TV sitcom is back with all new adventures written by Artistic Director David Cerda and directed by Becca Holloway. THE GOLDEN GIRLS will feature Chazie Bly, David Cerda, Adrian Hadlock, Ed Jones, Michael S. Miller and Grant Drager. For Halloween, Handbag conjures up a special treat: THE GOLDEN GIRLS: Bea Afraid! Our heroines return for seven spooky performances guaranteed to scare you out of your housecoat. The season will conclude with a soon-to-be-announced holiday production! Handbag’s 2018 Season will be staged at Mary’s Attic (5400 N. Clark St., Chicago) and Stage 773 (1225 W. Belmont Ave., Chicago). Season subscriptions and single tickets will be available shortly at www.handbagproductions.org. (front to back) Robert Williams and Ed Jones in Hell in a Handbag Production’ 2013 production of L’IMITATION OF LIFE, returning for Handbag’s 2018 season. Photo by Rick Aguilar Studios. 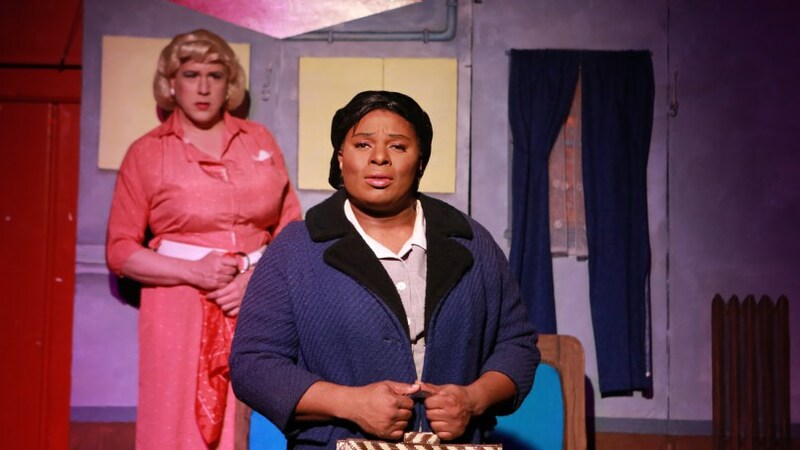 Featuring ensemble member Ed Jones (Lana Turner) with Robert Williams (Annie Johnson). Additional casting to be announced. In this hilarious parody of the1959 film Imitation of Life, Lana Turner is determined white widow and single mother with aspirations of becoming a Broadway sensation. When Lana meets Annie Johnson, a struggling single African-American mother, the two team up and take on the world as Lana does “whatever it takes” to make it in show business – while Annie takes care of the homestead and raises both daughters. The two women face insurmountable challenges led by their daughters. There's the blonde, perky and “so white it's frightening" Suzie, daughter of Lana Turner, and the raven-haired rebellious light-skinned beauty, Sara Jane, daughter of Annie. Sara Jane learns the hard truth about acceptance and the color of your skin- especially when she tries to “pass” as white. Featuring ensemble members Chazie Bly (Ensemble), David Cerda (Dorothy), Adrian Hadlock (Sophia), Ed Jones (Rose), Michael S. Miller (Ensemble) and Grant Drager (Blanche). When Handbag opened THE GOLDEN GIRLS – THE LOST EPISODES in June 2017, it was supposed to be short summer treat for Handbag audiences but quickly turned into a sold-out, seven month run! Now, these lovely women from the classic TV sitcom return with new stories of friendship, love and cheesecake – all with the Handbag twist audiences have come to love! Featuring ensemble members David Cerda (Mother Nurdiger), Sydney Genco (Roxanna), Ed Jones (Chester Nurdiger) and David Lipschutz (Zachary Slade). Additional casting to be announced. THE ARTIFICIAL JUNGLE is Charles Ludlam’s last play and a perfect vehicle for Hell in a Handbag! Chester Nurdiger is a mild-mannered fellow who lives in the back of the pet shop he runs with his sultry wife Roxanna and his overly protective mother. Roxanna is bored to death, but when a handsome drifter walks into their lives, things get interesting… perhaps even deadly?! Part Double Indemnity, part The Postman Always Rings Twice, THE ARTIFICIAL JUNGLE is throwback to the classic age of film noir by the master and founder of the Ridiculous Theater movement. It’s not Halloween without a Handbag show, so Artistic Director David Cerda is conjuring up a special edition of its hit TV sitcom parody. Better get your tickets early – Dorothy, Rose, Blanche and Sophia are only back for seven wig-raising performances. Bea afraid, Bea very afraid!